NADRA (National Database & Registration Authority) Pakistan achieves yet another success by launching another useful service. 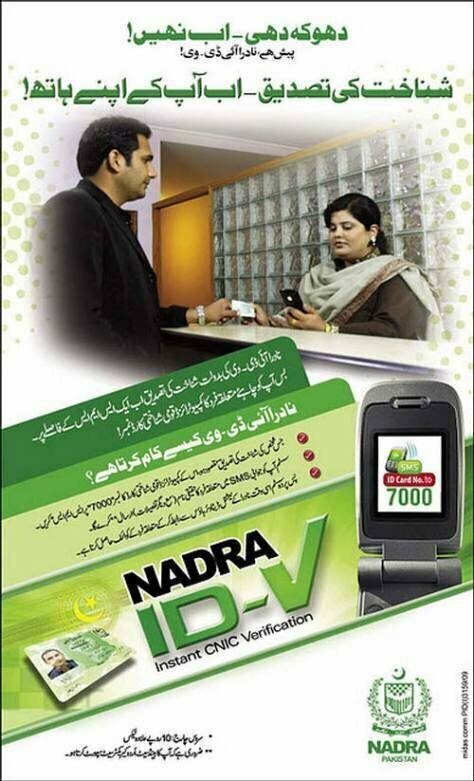 Now one can verify his/her computerized National Identity Card details by using this new system of NADRA. Now if you want to verify a person’s CNIC details, you don’t need to visit NADRA offices. If you are thinking to indulge in any kind of activity that needs the verification of CNIC, you can do it yourself. The procedure is very simple and anyone can do it very easily. In order to get details of a CNIC and to get his/her details, you just need to send an SMS to 7000. The CNIC number should be without dashes. You will get a notification of the details in which the name and father’s name of that CNIC holder will be mentioned. Remember you will get this SMS in Urdu fonts, so make sure you do it from a mobile set that can read Urdu fonts. The service is provided at a charge of PKR 10 + tax per single message. The total amount including tax is around PKR 12. The thought that directly comes to one’s mind is that this could help people to invade your privacy and could use these details for any evil purpose. It might be a security loop hole but the good news is that it provides name of the CNIC holder and his/her father name. No contact details are shared, therefore you can consider it safe and acceptable. Not only general public but the law-enforcement departments will also be heavily benefited from this service. They have a separate code to use in order to get the information. They will send a SMS to 7001. This information is provided to the users in collaboration with cellular companies which would collect data by communicating in real time with NADRA. The data transfer is secure and the numbers 7000 and 7001 are labelled as special numbers. Pls send me a potocopy of my cnic card.there is a problem in expiry date.i want to open an account in a bank.because of this issue is not processing. salam g kas ha ap.muje umid ha ka ap heryt sa honga.sir muje as name ke CNIC ka no chahye.